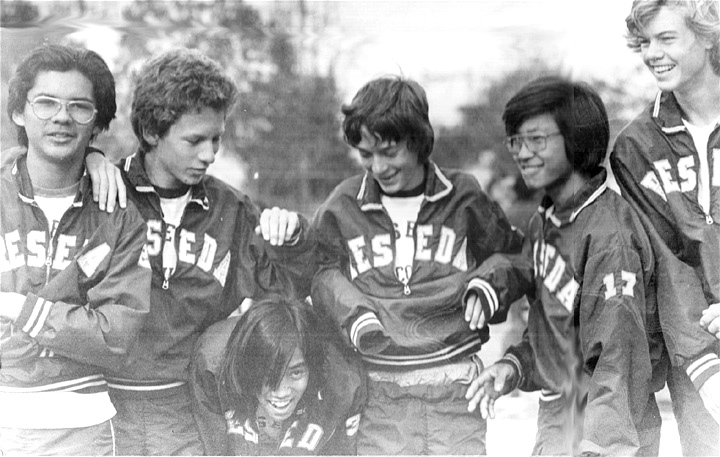 Alan Sahakangas memorial, Reseda Cross Country teammates, from left: Jim Stewart 76, Scott Bloom 76, Peter Sahakangas 77, Kimmo Sahakangas 76, Shudo 77. Van Nuys, CA. 5.20.11. Thanks Alan, R.I.P. Greg passed away in 2009. He attended Reseda with us for 10th and 11th grades. Dr. Gregory J. Klinker, DDS, 50, of Central Lake, Michigan, died Tuesday, July 7, 2009 at his home. He was born November 1, 1958, in Lafayette, IN, the son of Gerald and Nancy (Coilbert) Klinker. Dr. Klinker graduated from Carroll High School in Flora, IN. He went to Indiana University School of Dentistry and obtained his Dentistry license. He has practiced in northern Michigan for the last 15 years, most recently with his own business in East Jordan. Dr. Klinker enjoyed the outdoors especially fishing and riding his motorcycle. He is survived by his mother Nancy, his siblings Colleen, Andy, Chris, Matt, and Jerry and by several nieces and nephews. He is also survived by many, many friends. He was preceded in death by his father Gerald. The family received friends on Friday, July 10, 2009 from 4 to 6 p.m. at the Central Lake Chapel of Mortensen Funeral Homes in Central Lake, Michigan and on Monday, July 13, 2009 from 1 to 2 p.m. at Gundrum Funeral Home in Logansport. Interment was in Mount Hope Cemetery, Logansport, IN. Memorial donations may be directed to the Alzheimer’s Association. Please sign our online guestbook http://www.gundrumfuneralhome.com. May the Lord bless and keep you. May he show His face to you and have mercy on you. May he turn His face to you and give you peace. 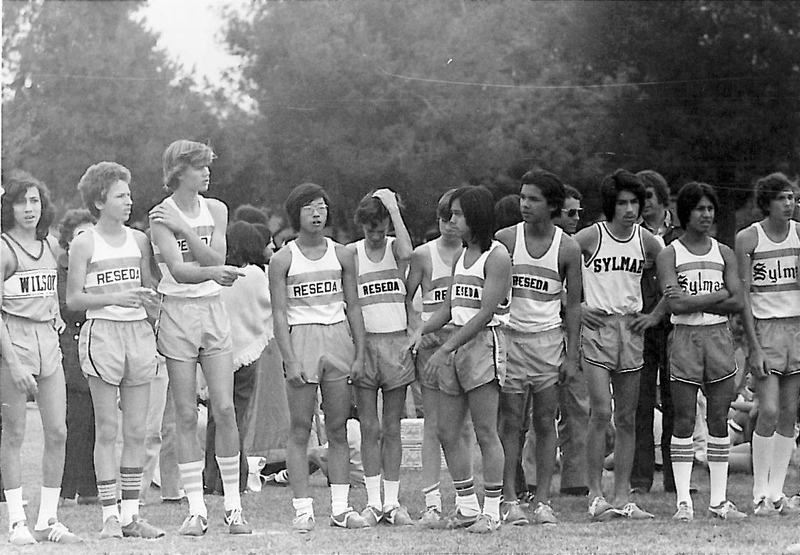 I think this is at a non-league meet at Legg Lake in Whittier Narrows. left to right: Eric Zucker, Scott Lance Messner, John Lammerding, Darrell Brown, Tom Whelpley, Daniel Shudo, Marcos Martinez. Some of us look nervous. The course was foreign to us, it was the first time we ran there. Hey, most of us were 15 years old. 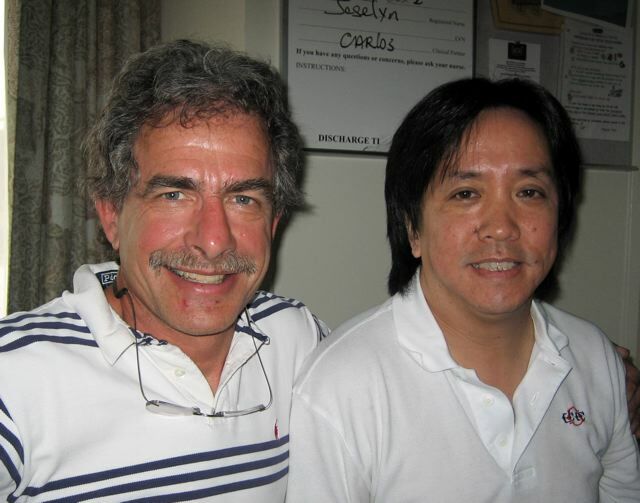 Eric Sokoloff plus 30 years, 8 months, and…..
Had a nice chat with our classmate Eric Sokoloff. Last time I saw him was in 1977. I met Eric in 10th grade on the cross country team. He keeps in great shape by riding his bicycle and motorcycles. Eric lives and works in socal. Eric Sokoloff, Daniel Shudo in Los Angeles, 2/28/08. Photo by Mark Zucker. 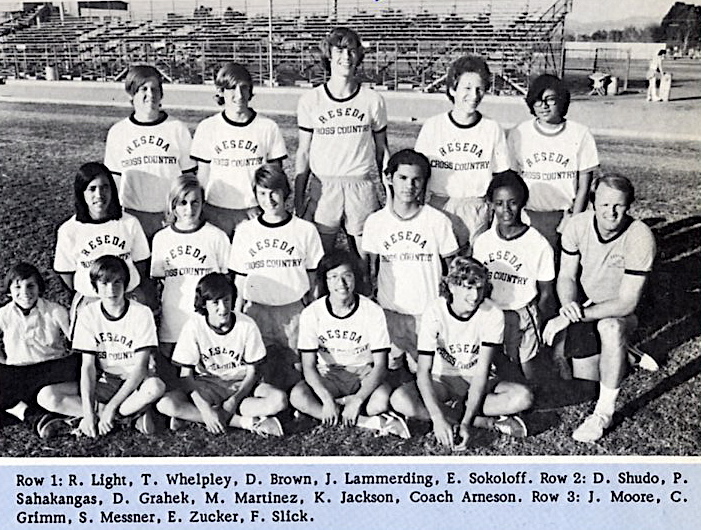 Fall 1974, 10th grade cross country team. 3rd place West Valley League. We had a great coach, Paul Arneson. Shudo, Brown, Messner, Grahek, Zucker, Jackson, and Whelpley attended the 30th reunion. 10th Grade Cross Country Team, coached by Paul Arneson. Workouts included: Running to the Encino water tower, do uphill sprints, and run back to Reseda. Run to Pierce College, work out on the cross country course (puke and hernia hills), then run back to Reseda. Running around the ducks and the pond at Reseda Park. Run to Balboa Park, around both golf courses and back to Reseda. We probably did all this during a first stage smog alert. “We do not breath what we cannot see”. 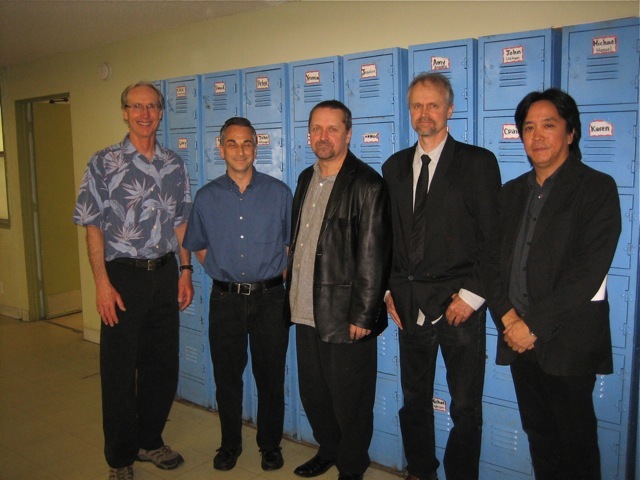 Left to Right: Marcos Martinez, Eric Zucker, Daniel Shudo, Darrell Brown, John Lammerding, Scott Lance Messner. Thank you for the photo Marcos Martinez.